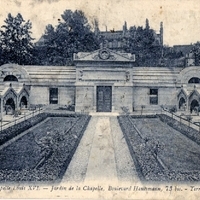 A postcard depicting the terrace of the Chapel of King Louis XVI of France, also known as the Chapelle Expiatoire, in Paris, Île-de-France, France. The chapel was erected in 1814 on the interment site of Louis XVI, also known as Louis Capet, and his wife, Queen Marie Antoinette, after their remains were moved to Saint-Denis. The exterior of the chapel, once surrounded by cypress trees, was converted into a public garden, which the postcard shows, in 1862. Originally published by Levy Fils and Cie Paris. The History of Paris, From the Earliest Period to the Present Day; Containing a Description of Its Antiquities, Public Buildings, Civil, Religious, Scientific and Commercial Institutions .. To Which Is Added, an Appendix: Containing a Notice of the Church of Saint Denis; an Account of the Violation of the Royal Tombs: Important Statistical Tables. Paris: A. and W. Galignani, 1825. “Terrace at the Chapel of Louis XVI Postcard.” RICHES of Central Florida accessed April 26, 2019, https://richesmi.cah.ucf.edu/omeka/items/show/6604.